So, off to the pho place with my insulated lunch bag to pick up something for dinner. It's a lot colder now than it was and I forgot my hat or scarf so brrrrr. And then, got there, and they were closed. Yep. I came home and checked their instagram that said they were open to see they had edited it to say they were open til 4. Oh well. Supporting the neighborhood and local businesses is not as easy as some might think. But I tried. 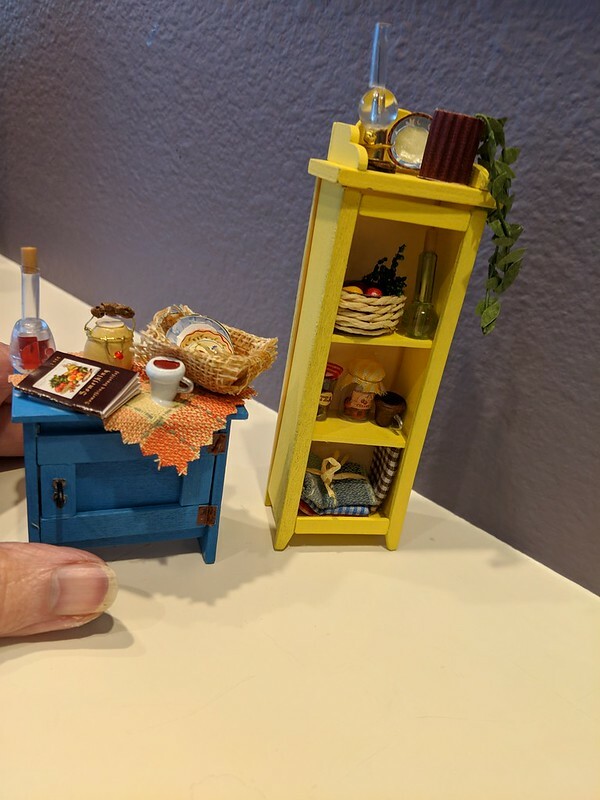 I also finished off another tiny piece from my latest kit. I actually don't have that much left to do. Maybe a day's worth or two. The other is too big and this is too small. I have a Goldilocks of tiny situation going on. 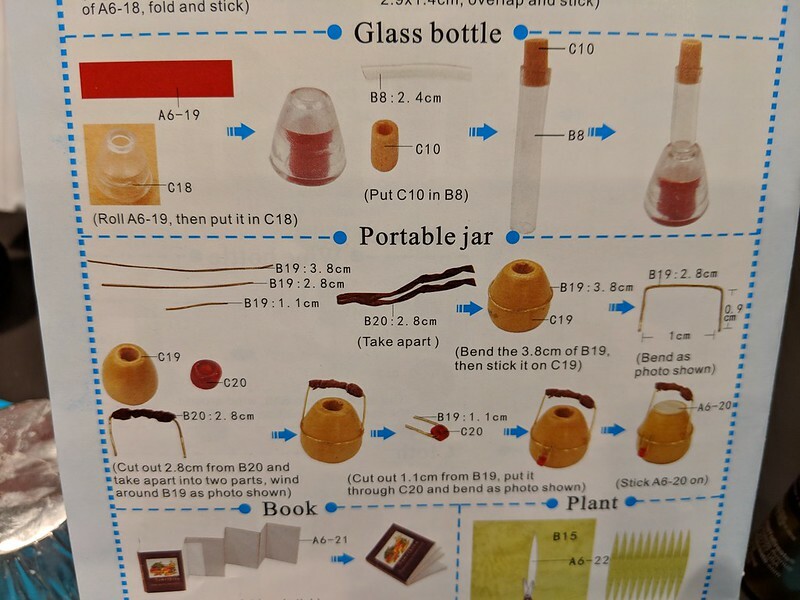 For an idea of what goes into making some of these, here are the instructions for that glass bottle and the little pot and the book. Some things you cut out of paper, and some you bend wire, and some you wrap stuff. It's really kind of interesting how they chose to have you build various items. But, I have, at least, finally figured out the very best glue to use. Aleene's 33147 Quick Dry Tacky Always Ready. The standing on its head thing is very excellent. It cleans up with water. It's way better/easier on my fingers. It dries really fast and holds with just a dab. Aleene's makes a bunch of different kinds so I originally got the variety pack. All are good but this is best and the applicator pushes over the finish line. Terri Gordon gave me some tiny tweezers and small scissors that are just perfect. I have some larger tweezers and a smallish roach clip that I use as well. Plus scads of toothpicks and a couple of sizes of binder clips. That's really my base toolkit. My secondary kit has wire clippers, needle nose pliers, scotch tape and an emery board. I just realized this would be better in a list. Ok, time for some dinner. I think maybe tonight is a good night for Breakfast For Dinner. I'm on it.